It sets a new standard in the way we write and interpret the Rules and is central to our efforts to ensure a healthy future for golf. We look forward to continuing that process in the years to come. Golf’s new Rules have been published by the USGA and The R&A ahead of their effective date on Jan. 1, 2019. 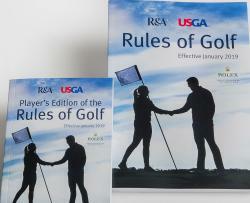 Printed copies of the Player’s Edition of the Rules of Golf, the complete Rules of Golf, and the Official Guidebook can be ordered at usgapublications.com. Digital versions exist at usga.org/rules or via the official USGA app found on the Apple App Store or Google Play. Please note that the 2019 version will update today if users have enabled automatic updates on their mobile device.